Last week, NPR's Diane Rehm Show focused on improving the sound of your voice (audio at this link) with a panel of vocal coaches and physicians talking about a wide range of vocal problems. 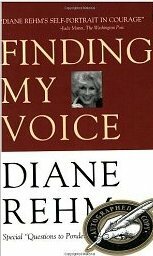 Rehm also contributed to the discussion, based on her own experiences with spasmodic dysphonia, which causes hoarseness and vocal tremors--a condition she developed after decades on the air. The nearly hour-long program includes calls and emails from listeners with perplexing vocal issues, resources for treating voice problems and tips for how to manage your voice to keep it healthy and vibrant. You'll find more, including comments from more listeners, in the transcript of the show "Improving the Sound of Your Voice" and in Finding My Voice, Rehm's account of her own vocal struggles.